Today, we’re unveiling the Xbox One 1TB console, with a new matte finish and more storage for your games and media. But that’s not all. We’re also including our newly designed Xbox One Wireless Controller, and in select regions for a limited time, Halo: The Master Chief Collection. The new Xbox One Wireless Controller now features a 3.5mm stereo jack that lets you plug a headset right into the controller. You’ll have the option to adjust headset volume, mic monitoring, and voice and game audio balance through the Settings menu on your console. In addition to audio improvements, we’ve fine-tuned the bumpers and enabled wireless firmware updates on the updated controller which eliminates having to connect the controller via USB cable to receive updates. 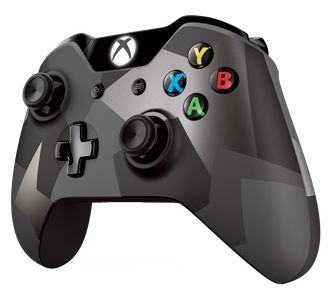 What’s more, you can purchase the new controller as a standalone item in black ($59.99 U.S. MSRP) as well as a new camouflage design in silver and black with the Xbox One Special Edition Covert Forces Wireless Controller ($64.99 U.S. MSRP). Xbox One 1TB consoles will start shipping to retailers June 16 in the United States and select markets later this month and will be available starting at $399 USD ERP. We’re also pleased to announce that starting today, the $349 USD price on all standard Xbox One 500GB consoles will be permanent in the United States and select regions. I posted some high resolution images and a video of the Covert Forces controller at my Flickr page. For more news related to the Xbox One 1TB console and new Xbox One Wireless Controller, check out Xbox Wire. Simple. All you have to do is leave a comment to this post responding to this announcement. Tell me what you think about the Xbox One 1TB Console, Covert Forces Controller, Wireless Adapter and/or the permanent price reduction and I’ll randomly choose two winners at the end of the week. One winner will win an Xbox One Special Edition Covert Forces Wireless Controller and a code for Xbox Live Gold (12 months). One winner will win an Xbox One Special Edition Covert Forces Wireless Controller. Leave a comment to this post with your response. Do not @ reply me on Twitter. That won’t count! Deadline to enter is 4:00 pm PT / 7:00 pm ET on Friday, 12 June 2015. One entry per person. Contest is open to everyone but prize availability might not be available in all regions. Winners will be notified via the e-mail account associated with their Disqus account or Twitter (when applicable) on or about 12 June. We use the Disqus commenting system – read this if you have questions about Disqus. Note: If you do not have an e-mail address or Twitter name associated with your Disqus login, you must include this information in your comment to be eligible. Any winner who does not respond to my notification within 72 hours will forfeit the prize. For faster notification, follow me on Twitter where I can DM you if you win. Only comments received at www.majornelson.com will be considered. Game Description: The award-winning fantasy role-playing series, The Elder Scrolls, goes online – no game subscription required. Experience this multiplayer role-playing game on your own or together with your friends, guild mates, and thousands of alliance members. Explore dangerous caves and dungeons in Skyrim, or craft quality goods to sell in the city of Daggerfall. Embark upon adventurous quests across Tamriel and engage in massive player versus player battles, or spend your days at the nearest fishing hole or reading one of many books of lore. The choices are yours in the persistent world of The Elder Scrolls Online: Tamriel Unlimited. Imperial Edition: Includes The Elder Scrolls Online: Tamriel Unlimited and the Imperial Edition Upgrade. Enhance your adventures with The Imperial Edition Upgrade. Gain access to the Imperial race, Imperial White Horse, the ability to craft and transform Imperial Gear, a Mudcrab vanity pet, and the Rings of Mara. Unlimited Premium Edition: Includes The Elder Scrolls Online: Tamriel Unlimited, the Imperial Edition Upgrade and the Explorer’s Pack. The Explorer’s pack grants you exclusive access to make a character in any alliance, an exclusive pet, and bonus treasure maps that will lead to some riches. Happy exploring! Here are this week’s games and add-on deals on the Xbox Games Store. Discounts are valid now through 15 June 2015. Please note: prices and availability are subject to change and may vary by region. Deals with Gold are valid for Xbox Live Gold members. With less than 2 weeks until E3, I wanted to update this post with all of the latest information. Updates are highlighted in red, but the big news is the location of the Xbox FanFest ticket giveaway has been identified. 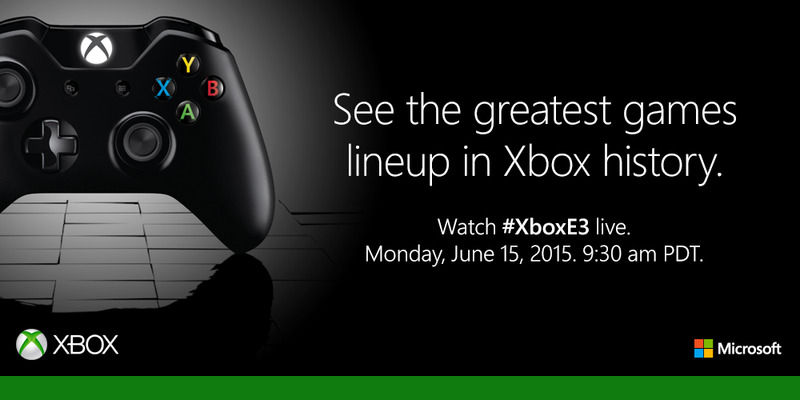 The Xbox E3 2015 Briefing will take place Monday, June 15, beginning at 12:30p ET/9:30a PT. You can watch the live stream of the Xbox E3 2015 Briefing on Xbox.com, via the Xbox Live Events Player, on Xbox One or Xbox 360 consoles and on Windows Phone globally. You can also watch the Xbox E3 2015 Briefing during “Xbox: Game On” on Spike TV in the U.S. and Canada at 12:30p ET/9:30a PT. Who: Hosted by me and Graeme Boyd, Xbox Live’s Acey Bongos. Includes guest stars and industry elites, including Head of Xbox Phil Spencer and guests from 343 Industries, Turn 10 Studios, Crystal Dynamics, and others. We’ve got an exciting lineup of co-hosts on tap this year, including Blair Herter, Tiffany Smith, iJustine, Andy “Bravo” Dudynsky, Alex “Goldenboy” Mendez, and Smosh Games’ David “Lasercorn” Moss, Joshua “The Jovenshire” Ovenshire and Amra “Flitz” Ricketts. What: A one hour show featuring breaking news, exclusive announcements, trailer reveals, game demos, and interviews with game creators. We’ll also be taking a look at the upcoming film “Terminator: Genisys”, and will debut a brand-new clip from the movie during one of our episodes. Where: The show will be streamed live on Xbox One, Xbox.com both on your desktop and mobile, and Xbox 360. Each show will also have interactive experiences created just for fans watching live on Xbox One. Make sure to download the free XLEi app on your Xbox One or XLE on your Xbox 360 in advance. For our PC gaming fans already getting excited for the upcoming release of Windows 10 on July 29, we recently announced that we’ll be co-sponsoring the PC Gaming Show on June 16 from 5-8 p.m PDT. Head of Xbox Phil Spencer and key members of the team will be showing off some great gaming experiences for Windows 10 (and maybe even a surprise), so be sure to catch the livestream of the show on the official PC Gaming Show site or on Twitch. Entry into the Xbox E3 2015 Briefing on Monday, June 15th, 9:30 am PT, at the Galen Center in downtown Los Angeles. Invite to the exclusive Xbox FanFest Party, Monday afternoon, June 15th, where fans will get to play the best exclusives and biggest blockbuster games this holiday and beyond. VIP access to the Xbox esports Celebrity Challenge & Twitch Party sponsored by Xbox. Meet-and-greet with some of the industry’s top developers, leaders and influencers. Even more surprise events during the week. Fans can begin lining up at Microsoft at Westfield Century City in Los Angeles, starting at 10 p.m. PDT on Saturday, June 13. This Microsoft store is located at 10250 Santa Monica Boulevard, Los Angeles, though the line will start near the LensCrafters on Avenue of the Stars. Head on over to the Xbox E3 Online Experience for complete information, as well as the Xbox FanFest: E3 2015 rules and regulations. And stay tuned to Xbox Wire for all the latest updates and news on E3! It was a busy week with some big announcements and I highlight everything you need to know in the latest episode of This Week on Xbox. Remember, you can watch the interactive version of This Week on Xbox Episode 5 from the “What’s On” tab of the Xbox dashboard in Canada, the UK and the US or at the Xbox YouTube channel. This Week on Xbox is your weekly source for all things Xbox. Headlines this week include the Fallout 4 announcement, a brand new trailer for Rise of the Tomb Raider, details on the Xbox Daily: Live @ E3 show, and much more! Leave a comment here or on Twitter and let me know what you think of the show. Game Description: The Swapper is an atmospheric puzzle platformer set in the furthest reaches of space. Players wield an experimental device able to clone the user and swap control between them. Dropped into a character and world as mysterious as the workings of the device itself, The Swapper is a game of exploration of a very personal nature. All of the art in The Swapper is constructed using clay models and other everyday materials.